"Necessity is the mother of invention," is a common saying that proves itself to be particularly true in times of war. World War II launched scientists and engineers belonging to both the Axis and the Allied powers into inventive frenzies in their efforts to hasten an end to hostilities; of course each side also wanted to be the victor. We all know how the story ended. Although some countries were not immediately able to capitalize on their countrymen's technical advances, within about a decade normalized relations had been established between former foes, and the exchange of products, services and scientific information proceeded. Some discoveries were deemed too valuable to national security and were therefore not divulged even, in some instances, to friendly nations. Many scientists consider themselves to be 'citizens of the world' and vehemently object to not sharing all available knowledge out of a belief that mankind as a whole suffers when information is reserved for a select few. Unfortunately while in theory the concept is noble, in reality it only works out well if everybody involved plays nicely. In light of that, I find it surprising that the U.S. Government permitted publication of this article on what would be the first public airing of a radioactively powered radio set. It implications were far-reaching. A photograph of the perfected Radium-Radio set. (1) The new radium currentless radio tube. (2) Tuned reeds to operate the radio alarm. (3) Electronic memory control to eliminate ad plugs. (4) Iron dust core tuning inductance. (5) Radio alarm. (6) Low and high volume knob. (7) Switch to cut in or cut out objectionable radio advertising plugs. What may turn out to be the greatest radio-electronic development since Marconi, is the subject of this revolutionary article. The Radium-Radio Receiver, with its cold radio-electronic tube, which uses no batteries or outside current of any kind, is so astonishing and so far-reaching in its import, that all of our radio receivers will soon undergo a complete change. How this great invention came about and how the inventor was persecuted by the large radio-electronic interests forms an equally astonishing adjunct to the annals of radio history. Radio-Craft therefore is not only proud in presenting the story of this amazing invention but also in exposing the nefarious work perpetrated by the powerful interests who conspired to block the Radium-Radio Receiver. It is certain that in so doing, Radio-Craft has rendered a signal service to the public at large. The receiver will be made after the war. It has always struck me that our present radio means, as far as our radio tubes and radio sets are concerned, were noting but clumsy makeshifts and that much better radio devices could be evolved in bringing radio programs to the masses. Our radio sets and radio tubes have always suffered from too great a complexity, which necessarily increases the cost of the final receiver to such a degree that it often could not be acquired by the man of very moderate means. It had always been my dream some day to produce a radio that would have evverything and that could be sold for less than $10.00, yet be a really first-class set. If such a, set were mass-produced, millions could probably be marketed for $5.00. These considerations were in my mind ever since the crystal set days. Then we had a radio set without any batteries whatsoever. It didn't consume current from the lighting mains and it could be easily transported and used anywhere. It did not have resistors and a multiplicity of condensers - electrolytic and otherwise. It was small and it was cheap. Best of all, the reception was also crystal clear. But with the coming of the vacuum tube radio set everything was changed and the entire radio industry followed blindly in a groove in which it has been ever since. The method used to solve this problem in the Radium-Radio (Ra-Ra) lube is simplicity itself, the only surprising thing about it is that someone has not stumbled on it earlier. The alpha and beta rays of radium are deflected by an ordinary magnet, but in opposite directions. 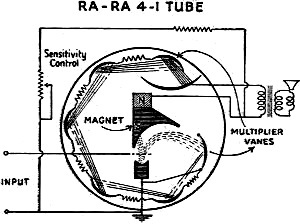 The anode of the Ra-Ra is a magnet. (See diagram.) The pole nearest the cathode is so shaped is so shaped that the beta rays, which are ordinary electrons, are deflected to the first of the multiplier plates which form an essential part of the tube. The alpha rays are bent very slightly in the opposite direction and impinge on the pole piece, or anode, with an extremely high positive charge. Emission of beta rays is controlled by the grid, which for electron-optical reasons is shaped like the grid of a thyratron. Means may be provided for keeping it negative with respect to the cathode. This tends to accelerate the positive alpha particles, and permits raising the anode to a higher potential, while not affecting the control of the beta rays, or electrons emanating from the cathode. A lead from the magnet-anode is brought out to the external high-voltage terminal of the tube. This is also connected through a resistor to the multiplier bank. The latter is constructed according to standard multiplier practice, resistors inside the tube maintaining each multiplier cathode-plate at a suitable voltage below the next one above it, etc. The lead from lowest-voltage multiplier plate is returned to the emitter, which is also grounded. A variable resistor across the entire multiplier bank controls emission and acts as a volume -control when the tube is used in radio reception. The final collector is returned to the magnet-anode through the load, which may be a loud-speaker, relay or indicating device. Magnetic shields, which assist in controlling and focusing the flow of electrons from plate to plate, are not shown, as they would unnecessarily complicate tile schematic and drawings. Under test, the Ra-Ra 4-1 worked well from 1 cycle to 300 megacycles. The electrode spacing of the tubs so far constructed has been adapted to work at audio and low radio frequencies, and there is little doubt that tubes designed for the work will oscillate far into the UHF region. Several years ago I started work on my Radium-Radio Tube - an electronic tube which requires no batteries of any kind. After the first few tubes had been constructed, I was encouraged a great deal, so much so that I finally evolved the revolutionary tube which is described in this article. Shorn of all technical language, the new cold Radium-Radio electronic tube makes use of radium for its electronic emission. This is not a new thought but is as old as radio itself, but up to now no such tube could be constructed because radium emanates both positive and negative emission, making such a tube useless. I then conceived the idea of using a magnet inside of the tube, using one pole of the magnet as a plate. Now radium, as we all know, emits two kinds of rays - the so-called Alpha and Beta rays. Both are deflected by an ordinary magnet but, fortunately, in opposite directions. Thus, by making the plate, or cathode, one pole of the magnet, I, can utilize the Beta rays which in reality are ordinary electrons, .just as they occur in a standard vacuum tube. Then I can utilize the Alpha rays on the other end of the magnet. I use these Alpha rays in conjunction with the well known "multiplier" device and thus increase the electrical energy obtained from the radium to operate the tube. Above I have given full technical data showing how a workable tube, which requires no outside electric currents of any kind, is constructed. Best and most important of all, the theoretical life of the Radium-Radio Tube, is as long as the life of radium - 2500 years. There being nothing to burn out, nothing used up except the infinitesimally small amount of radium, the tube for all practical purposes will be everlasting. I have had tubes of this type jn constant operation for over two years and they keep on working uninterruptedly, without any attention of any kind, day and night, month after month. The reader may ask: "By using radium in the cold Radium-Radio Tube, does this not make such a tube very expensive?" The answer is "no." Radium has come down in price until now it only costs $25,000 per gram, where originally it cost $150,000 per gram; but in my tube I only use the merest speck of radium, so little, in fact, that only about 30c worth is put into one tube. But I was not satisfied just to revolutionize the radio tube and all that goes with it - I wanted a radio set that would be a fit companion to this remarkable tube. After I had constructed a number of them, it was found that the sensitivity as well as the power of these tubes was unbelievably great, so great, in fact, that for the average home-radio set, I require only a solitary tube. Indeed, one tube is so powerful in its output, due to its terrific electronic emission, that instead of using a volume control on the speaker, I had to use what I call a "volume throttle." The power of the tube, in other words; is so great that if the:entire power of the single tube were turned loose into the loud-speaker, it would shatter it and bum out the field windings. For this reason, for the first time in, a radio set, it was necessary to incorporate small fuses in the speaker circuit to protect it! Another new and quite revolutionary point of this set is that it is never turned off. Having no batteries or no electric current to save, it is therefore unnecessary to turn the set off completely. The volume throttle is constructed in such a manner that when you turn it to "low," the receiver will operate at a mere whisper. At the broadcast station we have a special metallic gong arranged in such a manner that it will give a, certain, musical note. When this gong is struck with great force, a more than normal power-note is broadcast. In my set I have a tuned reed. This reed is tuned only to this special broadcast gong. Remember that the set is never turned off. When this special note comes over the circuit in my set; the reed starts vibrating, thereby making a contact which turns the set on to its "high" volume point. Immediately the news, such i as important war news, catastrophes, etc., is received with full power on my new radio set, and with such strength that the entire household cannot fail to hear it. The volume is strong enough to wake up a hearty sleeper. After the news has been received, the owner of the radio set turns it down again to the the "low" point, and the receiver is then ready for the next impulse when it comes along. This impulse - but a different kind ­ comes early in the morning when you desire to be awakened. Besides the special reed for news and other purposes, I provide four more extra reeds. Number 1 is marked 5 A.M.; Number 2, 6 A.M.; Number 3, 7 A.M.; Number 4, 8 A.M. Before you retire, you turn a little knob which puts one of the reeds into the circuit. Each reed is tuned to a different note. Every broadcast station (besides the large "news gong") will have four other gongs or whistles, all tuned to the four reeds of your set. Suppose you wish to get up at 8 A.M. and have turned the little knob on its appropriate reed marked 8 A.M. In due time in the morning, the 5, 6 and, 7 o'clock gongs or whistles will sound in the broadcast station (to which your set is tuned) but nothing happens, because none of the three reeds will be in the circuit, but at 8 o'clock the last reed will be connected and consequently, it will begin to vibrate, thus making its appropriate contact. This automatically turns on the set to "high" and the radio goes on full blast, awakening you on the dot. The above illustration shows an idealized view of the new tube. (1, 3) Reflecting, parts of the magnet. 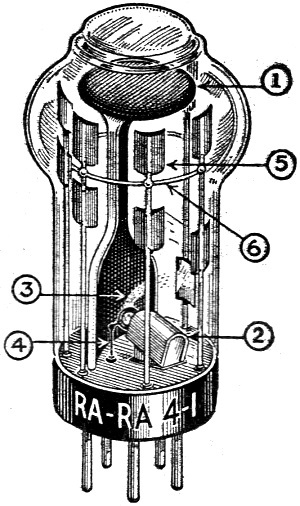 (2) Lead container with radium. (4) Grid. (5) Reflecting vanes. (6) Glass vane supports. For clarity's, sake, the resistors have not been shown in our illustration. That, however, is not all. I incorporated still another device in my set which I term "ad-plug-eliminator." I used the now well-known memory device of which several are made at the present time. * This is nothing but an electrical robot which has a "memory." I have improved upon the present device in such a manner that once. the radio set "hears" one of the many ad plugs, it stores it permanently in its mechanical brain. Then as soon as the same advertising plug begins again, the robot cuts the set off the air until the plug is finished, then the set is turned "on" again. In practice this works very well, but it is not to be confused with dignified occasional advertising of important programs. Only those 30 seconds or one minute pure ad-plugs which are a bane to so many people nowadays, are affected. The photographs in these pages show not only the new Radium-Radio Tube but the new Radium-Radio receiver as well. Now you would naturally assume that a great and revolutionary invention of this type should get immediate acceptance by the large radio manufacturers, but alas, the contrary is the fact. (6) a goodly number of others. The president pointed out to me that, for instance, the radio tube interests would immediately have their tube business cut tremendously because my set only uses a single tube. Worst of all, with a tube lasting theoretically 2500 years, there would be no tube replacements and once a tube was sold that would be the end of it, consequently the radio tube business would be "shot to Hell in no time" - these were the president's exact words. Then there was the radio set-building industry. Instead of getting prices anywhere from $50.00 to several hundred dollars for a set, "they will starve to death by making. your cheap and popular, pauper's set." I am using the president's words verbatim again. Then there would be the electric power interests. These gentlemen, too, would be hurt tremendously, because today radio sets use a most substantial amount of power; this is very lucrative business which the electric power industry would miss severely. Next inline was the venerable old alarm clock industry, which by means of my "crazy fool" set would be totally deprived of all of their business. Three-quarters of them would surely go out of business entirely because my radio receiver, being in a way an alarm clock itself, would be too powerful a competitor for the alarm clock business, thought the president. That leaves the broadcast interests, who, as I have already hinted above, would now be deprived of one of their most lucrative business plums - that is, short ad plugs now so common in America. Inasmuch as most of the small radio stations have to depend upon this type of business and as "that is their bread and butter, your hair-brained crazy 'mouse-trap radio' would put 60% of these poor stations out of business immediately." I am once more quoting the president. Then there is the battery industry which would be deprived of their "B" battery and "A" battery (portable sets) business as well, according to my spokesman. He cited several other industries which I was about to kill, and he left me dazed when he handed me a tabulation of all the millions of dollars' worth of business which my invention would exterminate with one "fell swoop" - in the president's words. I told him that I could see some justification in his contention but I also said that progress was like that and that the same argument could have been given to the inventor of the automobile, which put the horse and carriage trade out of business, too. I quoted many other new inventions which, worked havoc in a parallel line. But, I continued, you also must remember that when one of these revolutionary inventions comes along, it also benefits the public at large, and, damn it, I'm for the public-first, last and always." Then I gave him my ultimatum and told him that if he and his interests did not wish to buy my great invention at my own terms, I would start in the manufacturing business with private capital and manufacture the tubes and sets myself. He got very angry at this and we parted enemies. 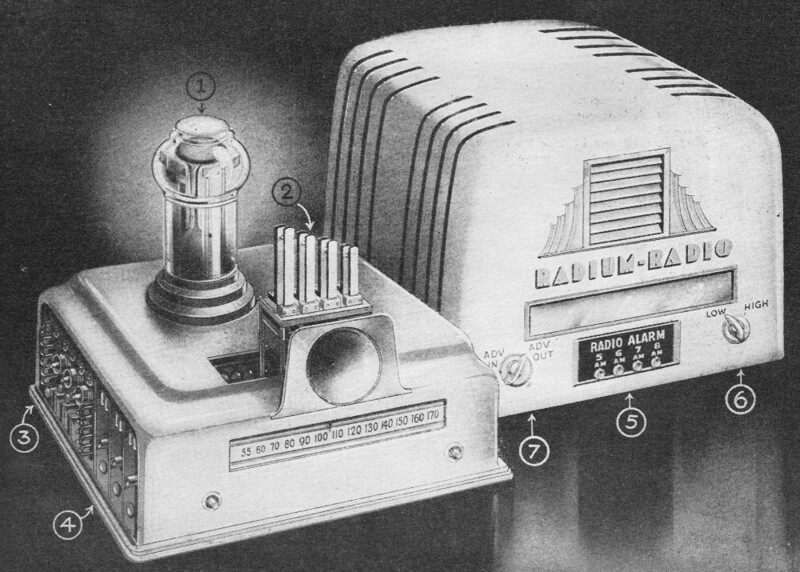 A simplified diagram of the new radium-radio set. 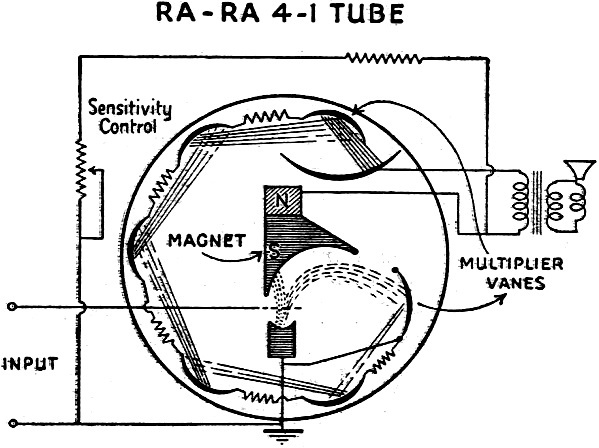 At the left we see the iron dust core tuning inductances and how they are connected with the RA-RA 4-1 tube. Also of interest are the tuned reeds which are energized by special gongs or whistles from the broadcast station. That was the beginning of my troubles. One night when I was putting the finishing touches to my radio set in my laboratory, there came a knock on the door. Being unmarried, I had only one good and trusty friend, and that was Annie. Annie is my pet anteater. She was very useful around tile laboratory because at one time I was interested in ants and built those little ant houses - the contrivances with live ants which you study through a plate glass. Sometimes some of the ants would escape, then Annie would eagerly lap them up so that they would not run all over the house and laboratory. Annie, .too, liked to eat sawdust and small shavings, and when I was busy filing a piece of metal she didn't mind eating some of the filings, as "roughage." Well, as I said before. there was an ominous knock at the door. Innocently enough I opened it, only to have a couple of burly gangsters jump me and I was tied hand and foot in no time. Poor Annie. too, was kidnapped along with me. They put her in a canvas bag, however, and lugged her along. There followed an interminable automobile ride and I sure thought my end had come. At dawn we pulled up in a wild-looking place which afterwards proved to be a small island in the midst of a lake. For two years I was confined in a sort of prison with a heavy iron grating, making my escape impossible. I was treated well enough during this period and we had enough food. When I say "we," I mean Annie and I. If it had not been for Annie, I think I would have died of loneliness. Several months ago during a terrific storm with an accompanying fire, I found a chance to escape - how I shall not say here for a number of reasons. I immediately decided that my life was no longer worth a plugged nickel, because I knew that the big interests were after me and would use every possible means to stop me from marketing my invention. So I decided that I would publish my entire invention in the pages of my favorite magazine, Radio-Craft, because I knew they would be courageous enough to at least give the world the news of my epoch-making inventions. Unfortunately, there were several reasons why I could not prosecute the big interests which kidnapped me and kept me out of circulation for two years. The main reason is that I have no absolute-proofs against them. Then, Annie was still in "jail" and I was in mortal fear that if I mentioned any names the gang would probably kill the poor companion of my kidnapping days. Since I returned home, I have written the president of the great radio corporation and told him that unless Annie was returned on a specified date, I would expose him and his bloodthirsty gang. 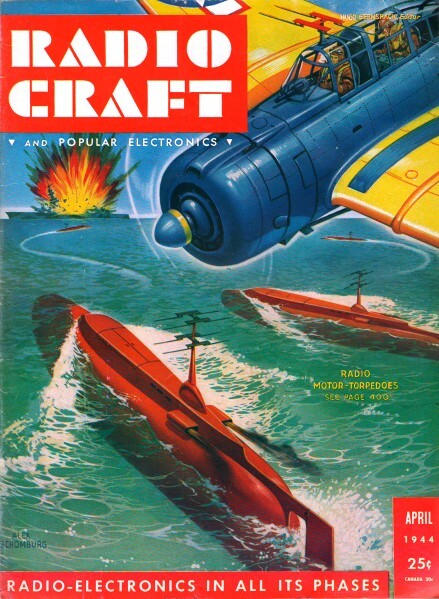 *See Radio-Craft. July, 1943, page 588, "Electric Memory Machine Helps Ignition Study."